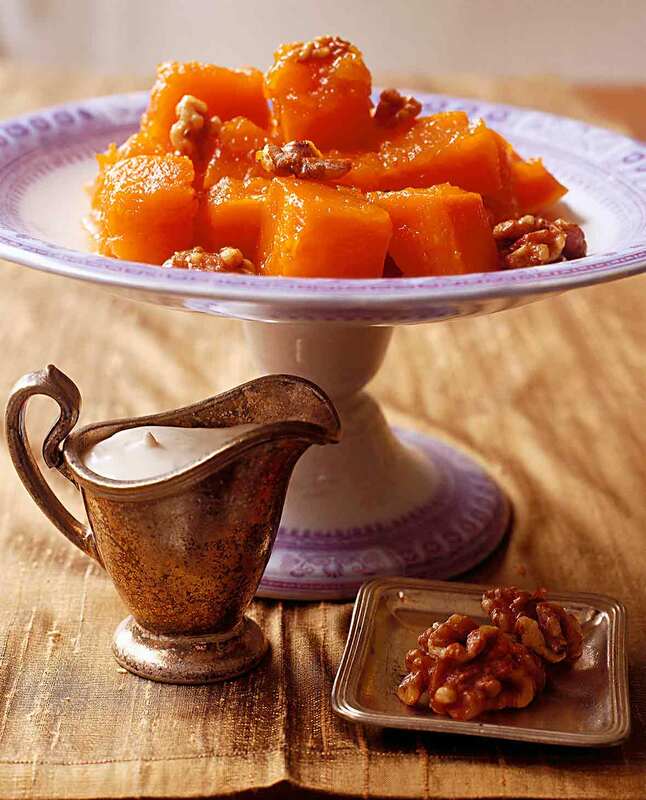 For this Turkish pumpkin dessert, pumpkin (or any winter squash) chunks are slow roasted in a sugar syrup and then sprinkled with toasted buttered walnuts. Pumpkin with walnuts is a surprising and easy-to-make Turkish recipe called kabak tatlisi. The cooking method is sorta fascinating: First you macerate chunks of pumpkin in sugar until they weep, then you cook the squash at a low temperature. As the squash chunks cool, they absorb the syrupy juices. The dessert—yes, pumpkin for dessert—goes beautifully with walnuts and a cultured cream such as crème fraîche or even yogurt. As stated above, whatever gourd you go for, bear in mind that oddly shaped squashes can be tricky to peel. We suggest sticking with a relatively smooth butternut squash, which is far easier to peel than a bumpy gourd. Here’s how you do it. Simply take a sharp chef’s knife and carefully halve the squash lengthwise. Scoop out those stringy seeds (a grapefruit spoon works really swell for this), then place the squash, cut-side down, on a cutting board or other work surface and run a vegetable peeler along its length. Tada! Easy peasy peeling with all fingers accounted for and intact. 1. Peel and trim the pumpkin. You should have about 1 pound. Cut the squash into 1-inch chunks. 2. Toss the pumpkin with the sugar in a shallow ceramic baking dish and let stand until the squash weeps and the sugar dissolves, at least 30 minutes and perhaps as long as 1 hour. 3. Crank the oven to 300°F (150°C). 4. Use a wooden spoon to toss the pumpkin and sugar. Cover with a crumpled sheet of damp parchment paper and bake for 1 1/2 hours, until the juices bubble and the pumpkin is tender throughout. Turn off the oven but do not remove the dish. Instead, let the pumpkin cool inside the warm environment so it can continue to reabsorb the syrupy juices. Store the pumpkin and its syrup in a cool place or in the refrigerator to allow the flavors to meld. Let the pumpkin return to room temperature before serving. 5. Just before serving, melt the butter in a skillet over medium-low heat. Add the walnuts and cook, tossing frequently, until they’re glistening. Spoon the squash and a few teaspoons of the syrup into individual serving bowls and sprinkle with the toasted walnuts. Garnish with dollops of cultured cream, whipped cream, or yogurt, if desired. 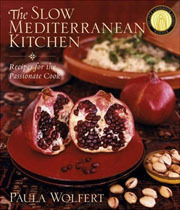 Turkish Pumpkin with Walnuts Recipe © 2003 Paula Wolfert. Photo © 2003 Christopher Hirsheimer. All rights reserved. All recipes and photos used with permission of the publisher.